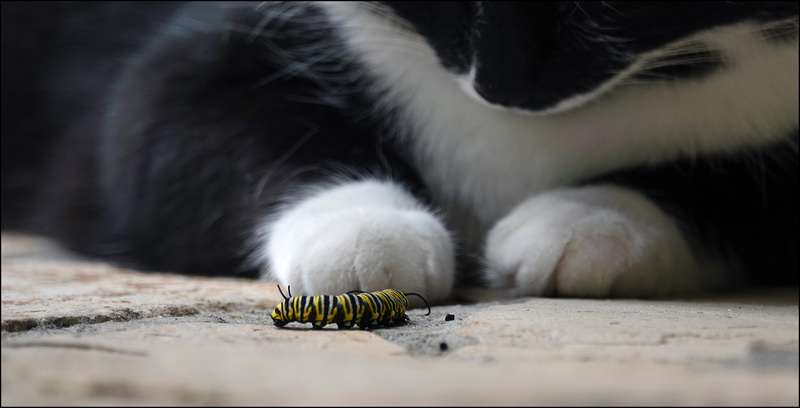 Is this catblogging or caterpillar blogging? You be the judge. As you can see, Hilbert was pretty intrigued by the caterpillar crossing his path, but in the end he didn’t do anything. He raised his paw at one point to give it a swipe, but for some reason decided not to. So the caterpillar made it safely to the other side and is now, I believe, a cocoon attached to the wall of the house. In a few days, if its luck holds, it will become another lovely Monarch butterfly. The life of a caterpillar must be a stressful one, don’t you think? Living in a world full of thousand-foot giants on the ground and predators the size of rocs in the air. Every morning at 6:30 it rains, but the raindrops are the size of refrigerators. And then there are the flash floods that come without notice, usually when one of the million-foot giants is around. It’s a wonder they don’t spontaneously explode just from high blood pressure.